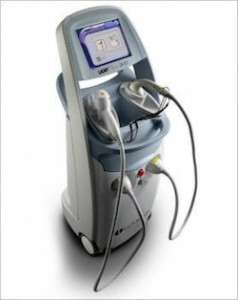 The Palomar Vectus Laser provides dependable, efficient hair removal that is perfect for high-volume practices. Cosmetic professionals looking for a high performing laser system can rely on the powerful technology provided by Vectus Laser system. With the Vectus Laser, you can quickly remove all hair types quickly and safely while enjoying low operating costs. The Vectus Laser is the ideal solution for hair removal professionals who are looking for a laser system that is designed to treat many clients throughout the day without sacrificing comfort, safety or performance. The Vectus was designed with innovative sapphire treatment tips as part of the laser’s Advanced Contact Cooling System, helping to protect the skin and reduce pain. Offering the largest active spot size and powerful, concentrated heat technology, the Vectus can remove hair from even the largest areas, including the back and legs, without losing quality. For those that want to increase their patient load or who are already becoming overwhelmed with cosmetic hair removal demand, the Vectus Laser machine is a highly dependable option. Not only is the Vectus system reliable, but it also features the only FDA-cleared melanin reader that makes it easy to provide a completely customized hair removal experience. With the Skintel Melanin Reader, you can develop a customized treatment that addresses major skin issues based on the customer’s diet, daily lifestyle habits, skin type and even ethnicity. It’s the ultimate way to provide the best possible skin treatment. The Vectus Laser system offers complete hair removal, even on tough areas like the back and chest, thanks to it’s highly functional design and intelligent features. The Vectus is a pain free option that utilizes a gentle pulsating motion that ensures energy gets deep into the stem cells inside each individual follicle. You can provide a more complete hair removal experience that combines powerful laser energy with highly effective cooling technology. It’s the comfortable, intelligent option for your large-scale cosmetic practice. Interested in adding a Palomar Vectus to your laser hair removal practice? SunrayLaser.com has great deals on used Palomar Vectus laser equipment from Cynosure with savings that are up to 60% off the original price! See for yourself how much you can save on used laser equipment when you buy from SunrayLaser.com. Looking for pricing information and other details about our selection of pre-owned Palomar Vectus equipment? Please fill out the form below and we’ll provide a fast and free, no obligation quote. It’s an easy and no-risk way to learn more about this outstanding line of lasers.